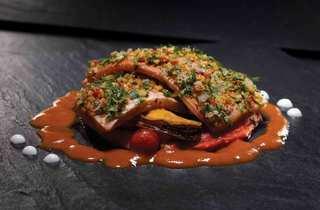 Has the term ‘molecular gastronomy’ worn out its welcome – and is Adriàesque ‘progressive’ cool aiming to revive the cuisine’s glory days? While the former usually results in unrecognisable ‘art pieces’, its emerging ‘progressive’ arm is more restrained. 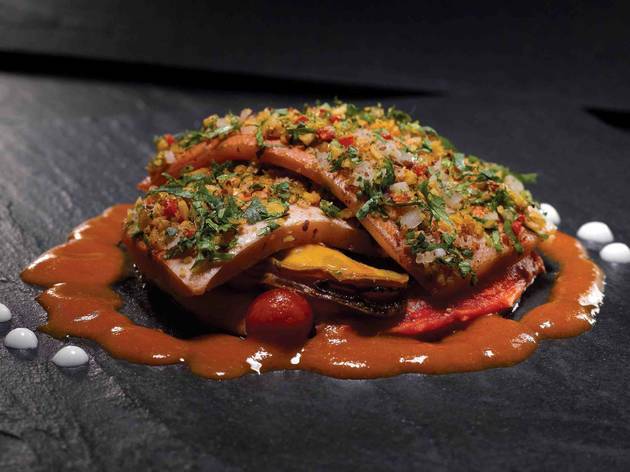 On the plates of Keystone, the attempt at progress veers away from mystery, sticking to the nature of the ingredients. Unfortunately, forced oddities get in the way. A former Ember chef, homecoming Singaporean Mark Richards’ modern, fusion approach stems from his days working in kitchens across Melbourne. In his grey-tableclothed Stanley Street shophouse of hardwood floors and dark red walls, the place settings bring character to the table: custom-made, fan-shaped slates set into ceramic plates and cutlery imported from Germany add an appropriately formal business-lunch appeal. For a genre in which nothing is predetermined, Keystone has set its own boundaries. Almost all main courses are served on warmed fl at dishes of grey stone. Presented with minimal scientific fanfare, the European-rooted components in Keystone’s dishes look and taste as they are supposed to, but are propped up subtly by non-traditional elements. A roulade of tender chicken breast ($39) sits on a meaty, complex reduction of marrow and porcini next to deep-fried triangular cubes of oozing polenta; a finely textured roll of Berkshire suckling pig ($43) is stuffed, fittingly, with pork belly and stewed-just-right pistachios, then topped with almost-julienned strips of crackling. The five-spice duck consommé ($19) is more playful: springy tofu noodles are produced by squeezing a mixture of tofu, truffle oil and vegetable cellulose-derived gelling agent out of a syringe, into a light, barely flavoured broth. At the root of it, it’s simple, interactive kiddie fun that hits home – but not all the time. The Textures of Oysters ($34) – a Buyan-worthy appetiser platter of six oysters – piques interest with its grand presentation. The molluscs are done three ways: deep-fried in breaded batter, topped with a rubbery foie gras and black miso sauce, and sauced with ‘sea foam’. There’s something strange about eating oysters straight out of the shell without the pleasure of slurping them up. The conviction is lacking – the dish could have been done with mussels and still retained the same textures. On the prix fixe lunch menu ($38), the melting foie gras-enhanced beef sliders (add $6) are spread with mixed berry jam. To avoid simplicity, and provide a quirky finish, the mini brioche burgers are served alongside an insubstantial glass of pineapple froth. The tedious process, as explained by the server, is to eat half the burger, take in the pineapple ‘air’, then take another bite and repeat three times; perhaps it would be better left uncomplicated. Keeping things simple, it seems, is not Keystone’s forte – both chocolate desserts (Nutella Bar, $16 and Valrhona fondant, $16) tasted satisfactory, but boring. Mirroring the enterprising cuisine it seeks to emulate, Keystone falls into the cracks between chi-chi and general appeal, and its desire to impress its crowd of cackly women and suited lunchers makes the food suffer.